Snap Track clamps are designed to quickly and securely fasten cable(s) to the cable tray without indenting or placing too much pressure on the cable. 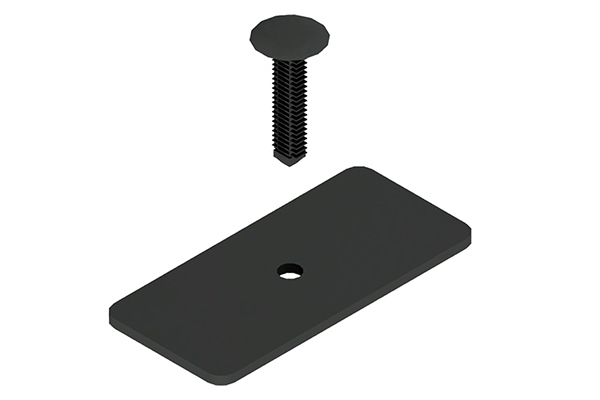 • Connects directly to the 5/16” square hole in Snap Track tray with a unique Push-In Xmas tree clip. • Rubber coated for added cable protection. • Manufactured from 14 gauge aluminum and designed to provide a slight spring tension. • Additional Colors Available. Black clamps are UV Resisant. Installation Guide – TechLine Mfg. recommends cables be fastened every 18 in. (450 mm) with Snap Track cable clamps on all vertical runs. Although not required by NEC, cables should also be fastened every 3 ft (1M) on horizontal runs to maintain spacing and prevent movement due to fault current magnetic forces.